House, 4 Bedrooms + Convertible bed(s), 3 Baths, (Sleeps 10-12) All new carpets. This is a large, well maintained home with all the amenities—pool table, hot tub, 60 inch HDTV, upgraded cable, Wifi, and even a second refrigerator for your beer, sodas, larger items, and all new carpets. This is a private lakefront home with a brand new kitchen with all new appliances, and there is a dual Lazy Boy reclining set for the living room, so there are 4 reclining loungers lined up for watching TV for you vacation couch potatoes! Please note linens are not provided. There is also a pool table room, and free Wifi! We have a full wall of storage shelving in the dining room--in addition to the kitchen cabinets--so you will have plenty of space to store your food items, plastic ware, etc.--no more rummaging through bags of stuff all around the house during your rental--I've been there, and we planned the layout to make your vacation stress free! There is a private fire pit area right before the lake with lots of surrounding tables and chairs--great for telling spooky stories at night! Or just hanging out and relaxing! Just a word of warning---our lakefronts are always completely booked in the summmer (and usually by May), so if you want a summer week, please contact us ASAP so you will get your choice of dates. We usually only ask for approx 1/3 deposit to block off your reservation dates. Just email from this site and we will get back to you. You also have your own dock with 2 boats---and the fishing is great (lots of large mouth bass and sunnies). This home is convenient to I-80 and the PA Turnpike, has plenty of amenities and is very well maintained. Your group can spend the entire week on site and no one will be complaining that there is nothing to do--there is plenty to keep everyone busy, including a full size non-violent video arcade game (Klax) and a dart board. The lving room/ dining room and kitchen have an open set up, so your group can all gather together for meals, TV watching, playing games, etc. and not be split up in separate areas. And we supply lots of extras others don't--while you're relaxing in your recliner, you can watch our upgraded cable TV, and we supply 40-50 movie DVDs and tapes. We have a gas grills on the deck so you can really enjoy the outdoor experience. The hot tub is outside on the downstairs patio, completely covered overhead so you can use it even in pouring rain. It is located in the back area of the house overlooking the lake, so you have privacy and a nice view, too. And you will be glad to know the owner maintains hot tubs as a side business, so our hot tubs are always clean and in operating order! For the adventurous group, whitewater rafting on the Lehigh River is really close--only two miles away! We are also right by the Lehigh biking/hiking trail (26 miles long next to the Lehigh River) and horseback riding. In cooler weather, you can use the two gas fireplaces---one in the living room, and one downstairs in the family room, and watch the 'fire' without having to buy and lug wood! We keep our houses well stocked and in good repair, and with plenty of extras others ignore. 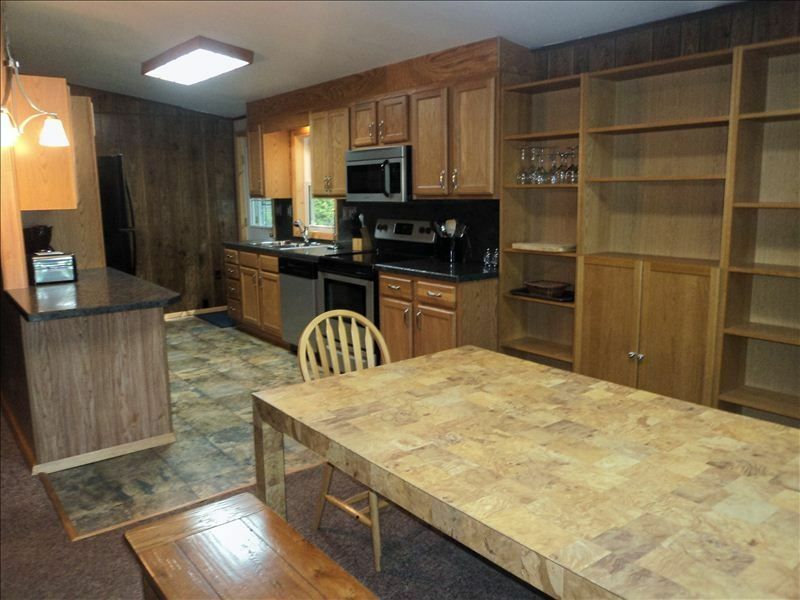 The kitchen has a new refrigerator and flat top range, and so much convenient storage space! We supply plenty of good quality pots, pans and other kitchen utensils. Our dining room table can seat 10, and there is also other seating in addition to outdoor tables on the deck and patio. However, we allow a maximum of 10 adults (not 12) but we will take a family of 12 (including small children). We also have a second refrigerator in the pool table room--very convenient for keeping all your sodas, beer, extra ice and larger trays of food--and you still have the room in the kitchen refrigerator for your regular food items--I said it before--we planned this house to make your vacation easy and stress free! If you have a really large group, we also have the home right next door and two other lakefront homes on the same lake (all in easy walking distance). Be sure to check the calendars for VRBO#354053, #740089 and #17854 if you are looking to rent more than one property at the same time. We DO NOT rent for a single night, unless you are willing to pay the 2 night rate. And we DO NOT rent to groups larger than our beds accommodate--this house holds maximum of 10 adults and 2 children. Summer is full weeks only, Friday to Friday, for $1550 a week starting June 10th. Pets are permitted with an additional security deposit. We are family-friendly - don't make Sparky stay home! Late checkout is sometimes available, especially on off season weekend rentals (but never in the summer). Sorry, NO young groups, NO proms, NO high school graduation parties without parents staying, too. 3 full bathrooms in the home. Master bedroom has full private bathroom with a shower. Main floor has full bathroom with shower/tub combination. Downstairs has a full bathroom with a shower. Had a lovely time in Michael's cabin! He was very communicative and very helpful. Everything was clean and in working order. No complaints! It was a very nice home and we enjoyed our stay except for the issue with the mattress cover and the shower liners. The house needs updating. A pool stick was was the only lock for the deck door, the upstairs gas fireplace kept going out, then popping on randomly. The rug in the master bath is just gross. Kitchen & dining area were fine....but the furniture & rugs need to be replaced. I would rate this place a 5 & rent it all the time if the owner would replace the very old dirty carpet & get a good cleaning crew in there. When we arrived the home was not cleaned & I had to spend the 1st couple hours of my vacation cleaning the place even though I paid a cleaning fee. I cleaned again before leaving. There is filthy old carpet in the master bath & I didn't feel clean getting out of the shower onto the dirty carpet that ppl have been urinating on for many years (toilet on carpet). I wore flip flops in the shower. Laminate flooring would work so much better in a pocono rental. There's also 1970's orange shag rugs in the bedrooms & stained indoor outdoor carpet in the living room. The downstairs bathroom had a shower curtain covered in mildew that smelled very bad & no one wanted to shower in there & some of the outdoor furniture for around the firepit no longer exists. Other than that this place is very nice. The kitchen & dining area are very nice & the out door space is fantastic. The bathroom on the main floor is fine also. I really hope the owner addresses these issues b/c the outdoor space is wonderful & is the reason we rented the home. I would love to rent this home again but want to feel clean after a shower & 2 of the 3 bathrooms were just gross & no one could use them. We had too many ppl to all use the 1 decent/clean bathroom. A wood look laminate flooring throughout & a good cleaning & this place would be absolutely wonderful. I gAve it a 4 due to the outdoor space, no hassle rental & kitchen/dining area. I rent several times a year in the Poconos & actually just returned from another rental today. You will definitely receive my repeat business if you update the dirty carpets especially in the master bath. Thank you. The carpets are cleaned twice a year once in the spring and once in the fall. The house is also cleaned by a pro after every rental. No other renters complained about the carpets, bathrooms or an uncleaned house. Some people are too picky for rental houses. Recently stayed here for a family vacation. It was a great location near hickory run state park and glen onoko falls. LOVED the fact that this place is dog friendly and come with boats/canoes to use on the lake! I would definitely consider coming back again. The only thing that needs a little updating is the address or the numbers on the side of the house. Directions say 103 lakeside but the number on the house says 34, so be aware when looking for the location! Mike is a good property owner. We have been dealing with him for years. As always, we loved our trip and felt right at home. We will be back.